It was a sunny Sunday afternoon and I was watching my oldest daughter play a mid-season soccer game. The two teams were evenly matched and battled valiantly, contending for every ball – as only ten year old girls with something to prove, can. Suddenly, two players collided at midfield. One didn’t get up. The referee signaled for the coach to come onto the field to attend to his player. 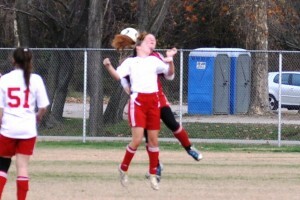 There was an anxious silence on the sidelines, as we all watched to see if this girl would be okay. After a few tears and with a helping hand, she limped off the field, to respectful applause from parents and both benches. This was fast-becoming a regular occurrence on any given weekend, but this time I chided myself. A parent who knew my background in sports medicine, teaching and coaching had introduced me to a new ACL injury prevention program that was easy to implement and was preventing these knee injuries, especially in girls. I grew up in sports and had 3 daughters playing sports. I knew I couldn’t just stand by and watch another child get hurt if there was something I could do. Fit2Finish was born. The ACL injury prevention program I had heard about came from ground-breaking research done by Tim Hewett (now director of sports medicine research at the Mayo Clinic) who designed a preseason training program and accompanying dynamic warm up which significantly reduced ACL injuries in girls. Working with the our travel team coach, I put the girls on my daughter’s U11 team through some sport-movement tests to see if they showed the tendency toward injuries that Hewett was seeing. They did. BUT these tween-aged girls couldn’t perform the plyometric (jumps, hops, leaps and landings) his program advised. Hewett had worked with high school and college aged athletes. My much younger kids didn’t have the strength, balance, coordination or proprioception to get the drills right. In fact, their attempts at the drills just served to re-enforce the poor mechanics that put their knees (ankles, hips and heads) at risk. They needed “remedial” training. But it couldn’t look like training because kids come to play and they don’t want to worry about getting hurt. Fit2Finish training games sprang to life. I designed soccer-like games for the kids to strengthen what was weak and help them build bilateral balance, improve coordination and develop smooth, fluid movement. They didn’t know it was good for them. It was just fun. This caught on. Coaches invited me to teach their teams how to incorporate the Fit2Finish games. Using simple equipment on the pitch, we played fitness games that worked soccer muscles and developed soccer skills. At the Virginia Youth Soccer Association convention, we had a packed house of coaches, administrators and kids trying the bands, hops, jumps and balance games. Good fun and good for the knees. Fit2Finish has been in action for over 15 years, and I am delighted to say that no athlete on any team we have trained who was regularly using the Fit2Finish games training program has suffered an ACL tear. 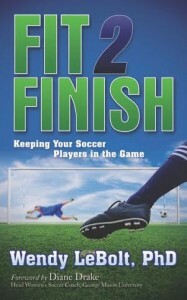 Coaches at all levels of the game have told me how helpful they have found the Fit2Finish resources. Recreational and competitive coaches love the fitness game videos. Competitive coaches love the anatomy and physiology behind training design because they want to know the science of fitness. Professional coaches love the concise information and player handouts on nutrition, hydration, flexibility and recovery. All coaches love the easy reference to reliable sports medicine information on common injuries and training to avoid them. Parents tell me the most important thing about the Fit2Finish approach is that it starts and ends with the health of their child. Join our team of parents and coaches who believe that the most important thing we do for our kids is to help them be fit to finish — the game, the season, the school year and their sporting career — healthy and excited to stay in the game. Sign-up here to receive your free F2F newsletter. The Fit2Finish handbook makes a great gift! You can order it here or through your local bookseller.